Jigsaw is back, baby! 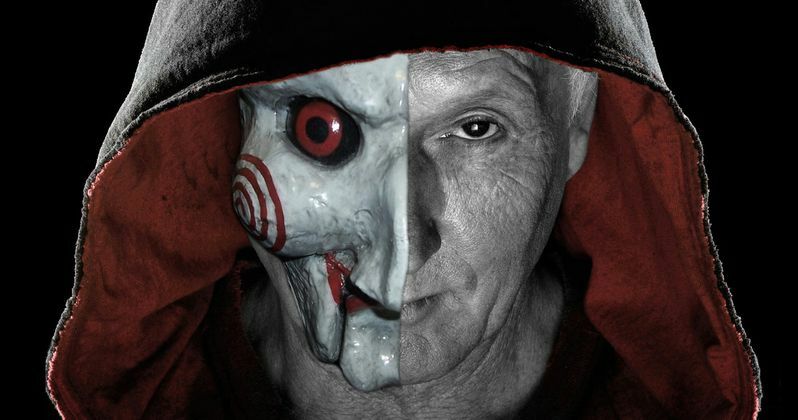 Yes, it has been confirmed that Tobin Bell will reprise his role as the infamous serial killer with a game to play in this year's Halloween release Saw Legacy. But don't expect him to dominate the movie, as the actor is only expected to be back in a limited capacity. When it first arrived over 14 years ago, Saw was considered a groundbreaking film in the horror genre. And it spawned 6 sequels, bringing the saga to an end in 2010. For seven years, it was a Halloween tradition. That tradition returns this October 27 with an all-new installment of the iconic series. But what is this next chapter about? And is it a sequel or a reboot? Bloody Disgusting has the answer with exclusive new plot details and the confirmation that Tobin Bell will be crawling out of that proverbial grave at least one more time to torture a few well-deserving individuals. Up until this point, plot details have been kept mum. Except a few set photos did reveal that there will at least be some grave robbing going down in the opening moments of this next installment. Now we know that Saw 8 opens with bodies turning up all over the city. Each corpse has met their own unique demise. An investigation gets underway. And all fingers point to John Kramer, aka Jigsaw. But how can this be? Jigsaw has been dead for more than a decade. The belief is that an apprentice has stepped in to pick up the mantle left behind by Kramer. And the clues may lead to someone embedded within the investigation. Neither Costas Mandylor nor Cary Elwes, both exposed as Kramer apprentices in past installments, are returning for Legacy. The new cast includes Mandela Van Peebles, Hannah Anderson, Laura Vandervoort, Brittany Allen, Callum Keith Rennie, Matt Passmore, Hannah Emily Anderson, Josiah Black, Shaquan Lewis, Michael Bolsvert, and James Gomez. The Spierig brothers, Peter and Michael, will be directing this latest installment of the Saw series. They are best known for their cult efforts Undead, Daybreakers and Predestination. Josh Stolberg and Pete Goldfinger wrote the screenplay. They previously collaborated on Piranha 3D, Piranha 3DD, and Sorority Row. Mark Burg and Oren Koules, who have been with the been with the franchise forever, are returning to produce. Saw 8 is currently in post-production. Jon Cor's Ryan from the last installment, 2010's Saw 3D is rumored to be back in this sequel. Ryan was seen in the opening trap with Sebastian Pigot's Brad in Saw 7. Writers Patrick Melton and Marcus Dunstan previously revealed in that film's commentary track for the Blu-ray and DVD release, that it was Ryan and Brad who were wearing the pig masks at the end of the film, leading to speculation they may be the ones who unearthed Jigsaw's grave. Jigsaw died in Saw III, but he has been featured through flashbacks in the subsequent Saw movies. With Tobin Bell returning here, it sounds like Saw fans are in for even more flashbacks. Unless Jigsaw has a, gasp...Twin Brother? But they wouldn't do that...Would they?